Do you know what you’re digging with? Many people don’t know that shovels and spades are actually two different tools with different uses. There are so many garden tools out there that it can be overwhelming and hard to know which tools to use for which jobs, but if you know how to choose the right tools, your garden and landscaping projects will be significantly easier on your body and everything will go more smoothly. This guide will teach you how to tell the difference between shovels and spades, how to properly use them, and which tool to pick for which job. Disclosure: this post has been sponsored by A.M. Leonard’s Gardener’s Edge who also provided me with the shovels and spades to try. And they want you to try them too! 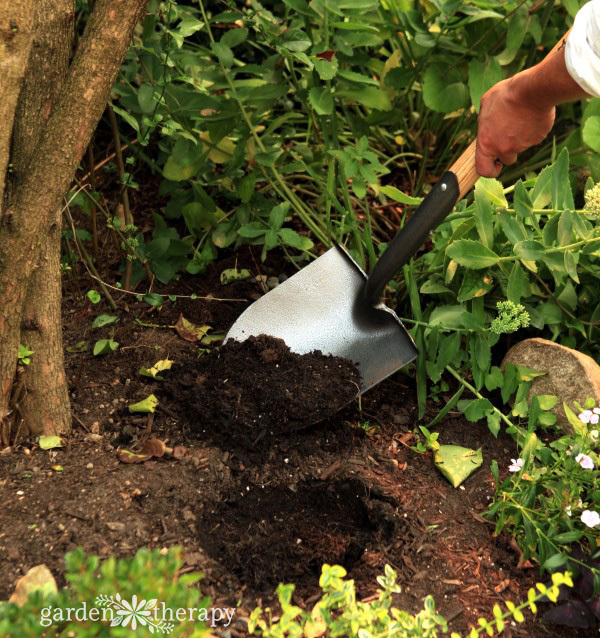 Be sure to check out how you can get your hands on the shovel or spade of your dreams from Gardener’s Edge at the end of this post. All opinions within the post remain my own. So, what is the difference between a shovel and a spade? A spade is shorter and has a flat blade, while a shovel is longer, angled, and its blade is curved into more of a scoop. 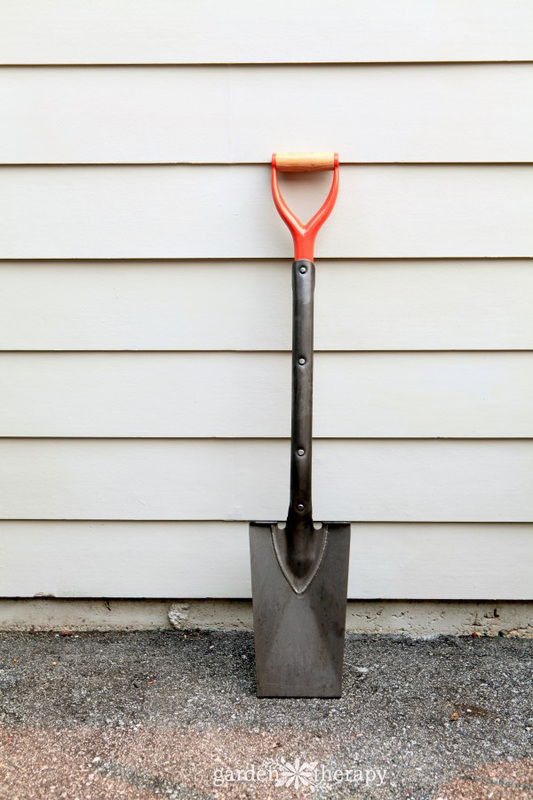 Shovels are better for digging up, breaking apart, and lifting soil as well as for scooping and moving loose materials. 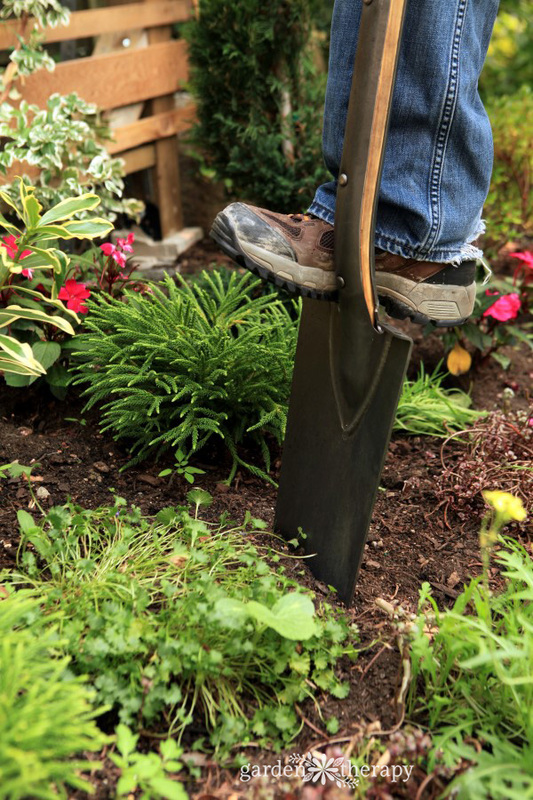 Spades are best for cutting into sod, edging, or digging trenches—anything that requires a sharp, straight edge. 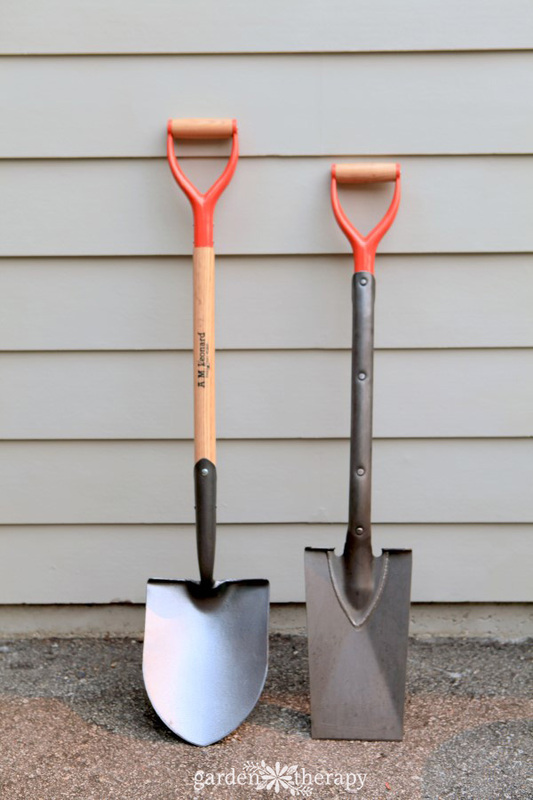 Shovels should be inserted into the ground at an angle and pushed slightly forward, while spades should be pushed into the ground vertically to create a straight edge. As with any outdoor work, use your common sense and be mindful of the heat, stay hydrated, stretch, and take breaks. 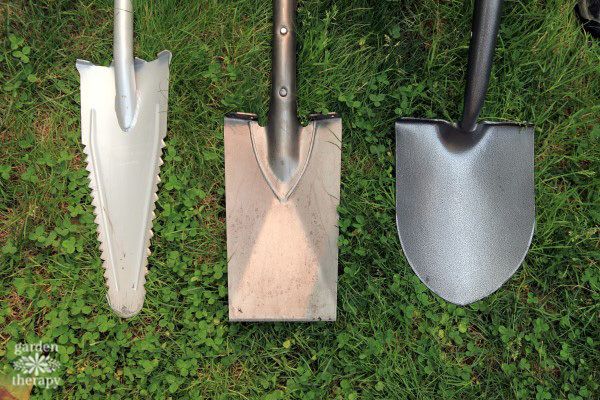 Shovels and spades are made of similar basic parts—the handle, step, and blade—but they have subtle variances which might not look like much at first, but make all the difference in what these tools can do. Spade: shorter, straight handle with a D or T grip at the top to make it easy to hold. Shovel: long, upward-angled handle, often no grip at the top since shovels are usually held by the handle at an angle, not by the very top. 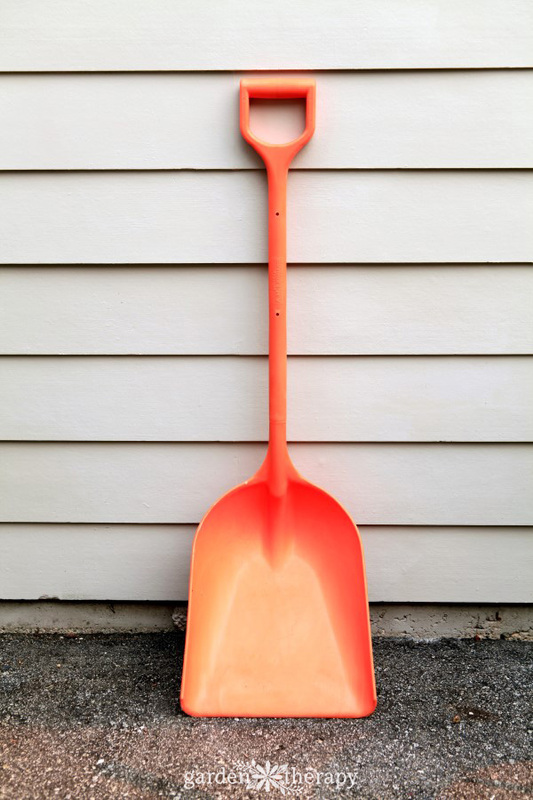 Shovels do frequently have some type of padding around the upper section of the handle to make holding it more comfortable. 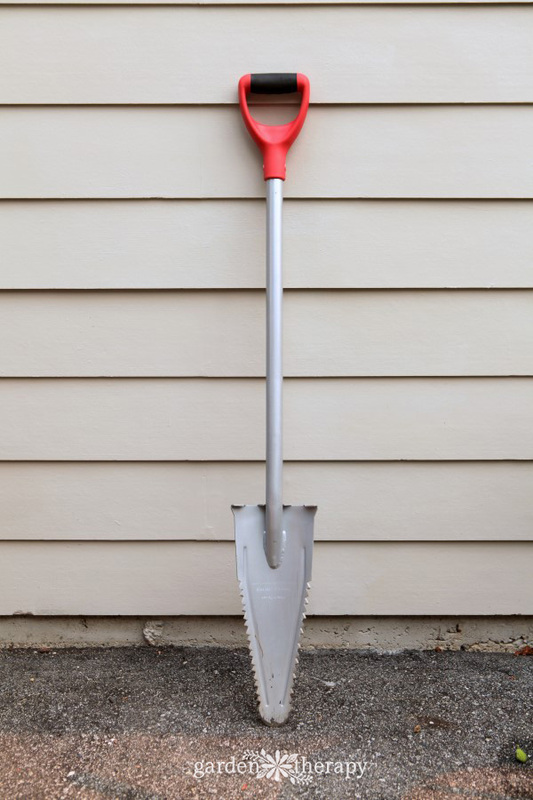 Spade: small ledge on top of the blade on either side of the handle, so that you can rest your foot on it and press down into the soil with the strength of your leg. Shovel: smaller or no step ledge, as shovels are not intended for the type of work that requires as much extra force of a foot on the blade (such as edging) and a bulky step would get in the way when scooping and lifting material at an angle. Spade: flat blade with a square-shaped end. Shovel: curved, bowl-shaped blade, usually rounded or pointed at the end, but shovels with square-shaped blades are available as well. Keep in mind that there are many different blade weights, which will dramatically change the experience of handling a shovel or spade. Professional-grade shovels can get very heavy, which means that they are great for heavy lifting but can also be difficult to use. Lighter shovels are less powerful, but are much more usable for many and are a good choice for those with limited abilities. Try out the different weights and see what feels comfortable to you—I personally prefer a lighter shovel, while my partner prefers a heavier one. Lightweight and easy to use as well as affordable, the ash handle is very durable, and the deeply scooped blade makes it ideal for lifting and moving loose material. 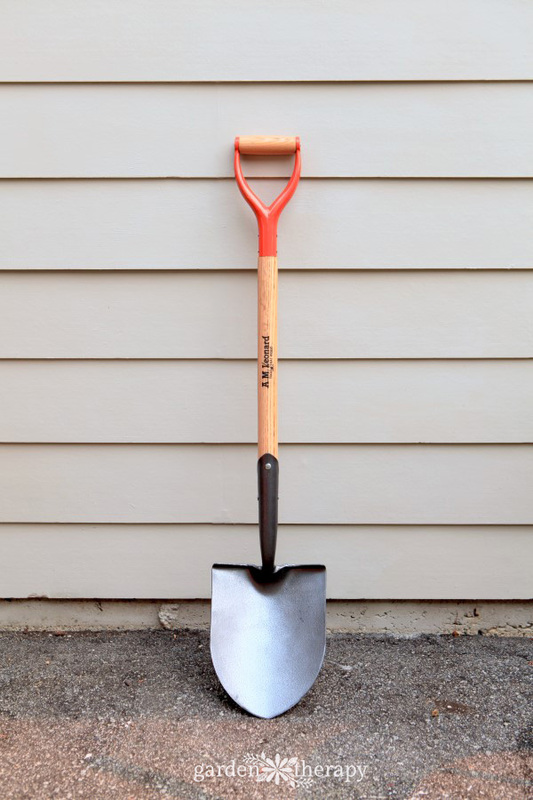 This shovel is quite heavy, so it is not suitable for everyone, but if you like a heavier shovel this one is very powerful and will last forever (it even comes with a lifetime warranty). The strong fiberglass handle is angled at a high lift, so you won’t have to bend too far when you’re digging, which will reduce strain on your back. Great for scooping up gravel and other loose materials and clearing away snow. The poly material is weather resistant and won’t rust or damage surfaces (so you can use it on your deck without worrying about scratches). 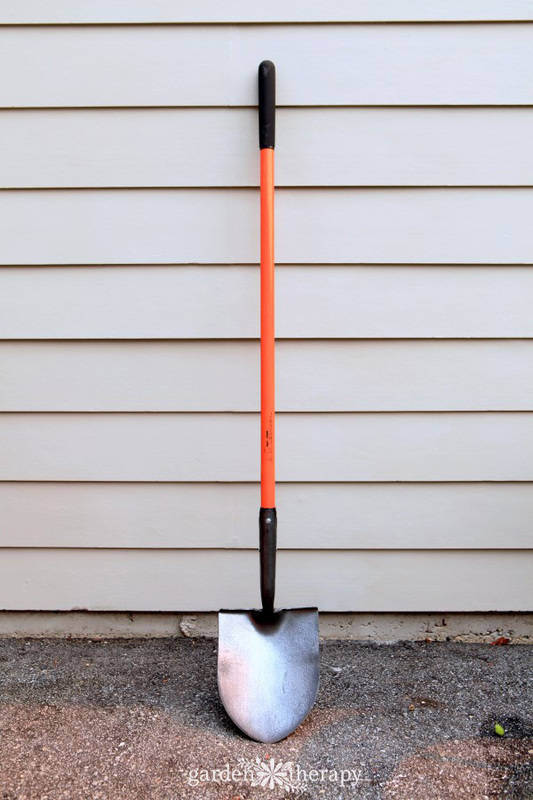 This shovel also has an extended, lifted handle to help save your back while you scoop. At just 26” tall, this little spade can do big things. 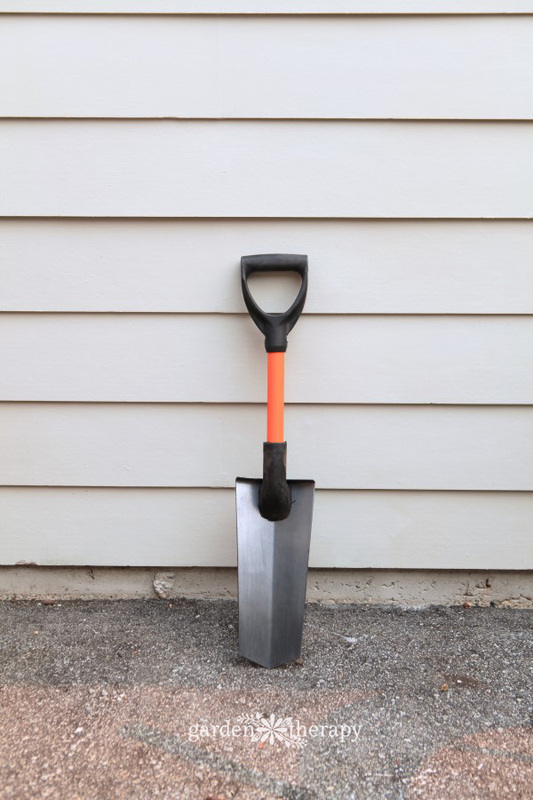 It is perfect for transplanting those plants that are too big for a hand trowel, and it is also a lifesaver for dividing plants, stripping sod, and other projects that require some precision. This is a great basic spade. The beveled edge of the blade is crafted specifically so that it doesn’t require sharpening, so this tool is very low maintenance. It is durable, strong, and has a large step and foot pad to cushion your foot and reduce strain. The Root Assassin is a small, tapered shovel with saw teeth on either side of the blade that work to cut through roots while you dig. 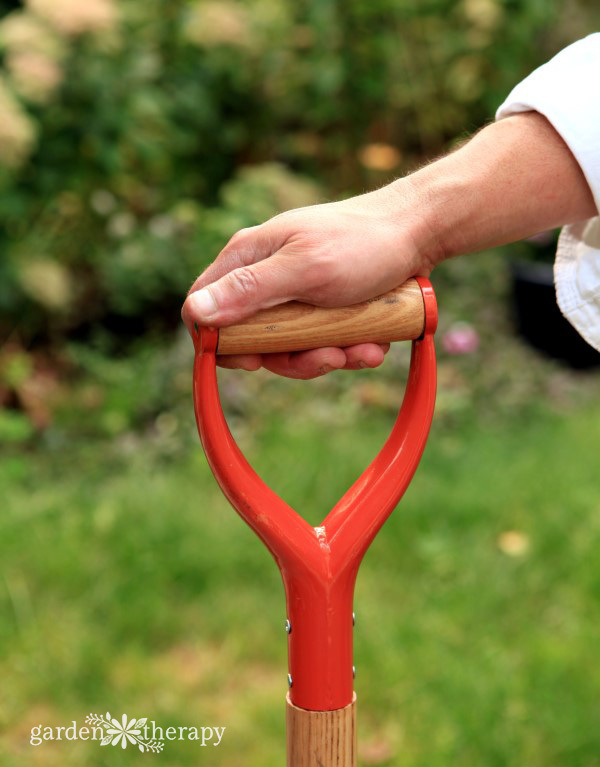 It is great for digging trenches and digging in areas that are overgrown with roots. The padded D-grip handle makes it comfortable to hold and easy to maneuver. Pick a shovel, any shovel (or spade). 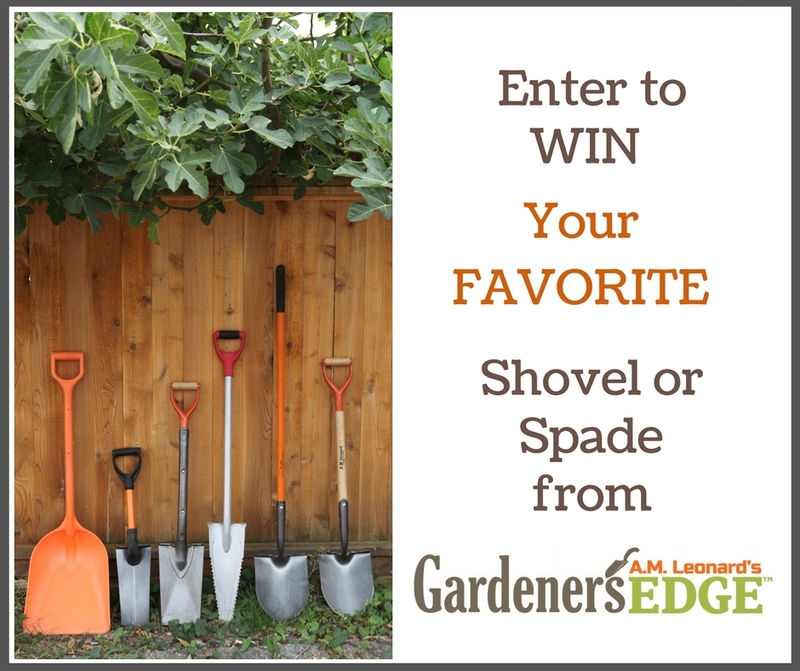 Gardener’s Edge has generously agreed to GIVE AWAY the shovel or spade of your dreams! The winner of this contest was Kay. Congratulations, Kay! 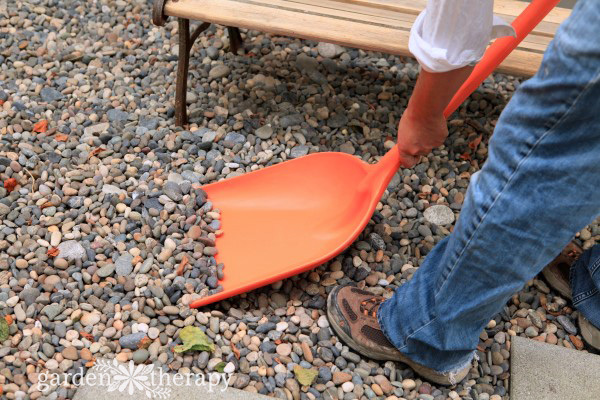 The Leonard Poly Scoop Shovel with Extended D Grip Handle would be a huge help with the cleanup of my yard for autumn. I could really use the Leonard Poly Scoop Shovel with Extended D Grip Handle! I order about 20 cubic yards or fresh mulch each year and this would help move it quicker and easier. 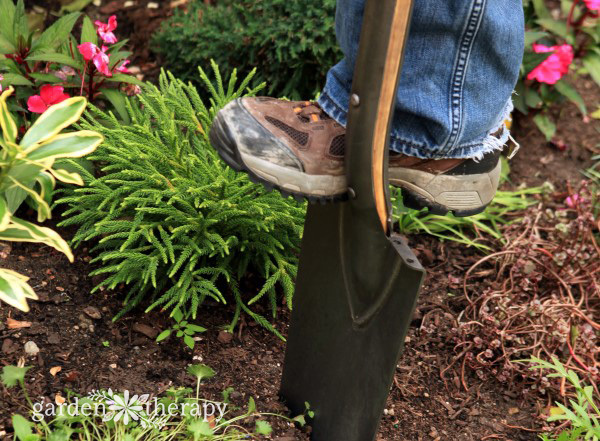 The Shortie Transplant Spade will help me dig up and separate my daylilies, just waiting for a little cooler weather. They have been in the same bed for 4 years and I want to plant more on a steep hill to help with erosion. I think I’m better at using shovels with T grip.